Here at Four Seasons Florists we know that lilies are a firm favourite with many of our customers, and their unique style makes them a wonderful choice for a gift. The eye catching look of lilies means that any bouquet containing them will have a truly memorable effect on everyone who sees them. A bouquet of lilies is a fantastic choice for a gift or a decorative arrangement for the workplace or home. 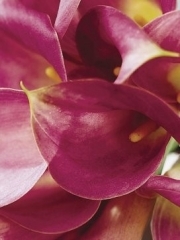 This is why the florists at Four Seasons Aberdeen have dedicated this particular page of our site to the variety of different flower arrangements containing lilies which we have available. 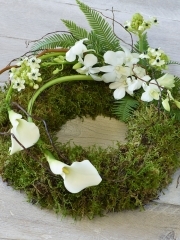 Our florists have over 40 years of experience in the floristry industry, meaning that the lily arrangement which you order from us will be hand crafted with a great deal of skill and expertise. We use only the freshest flowers available to us for all of our arrangements, as we order flowers from Holland on a regular basis. This means that by ordering your lily arrangement with us you will be able to enjoy some of the finest lilies available in Europe. 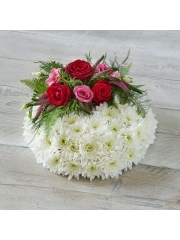 The florists at Four Seasons are confident that our customers will be able to find something which suits their tastes from our vast collection of different arrangements that we have on offer, but if you are struggling to find exactly what it is that you’re looking for, there is no need for concern. The florists at Four Seasons are delighted to be able to offer a bespoke flower arrangement service for our customers to consult, in order to purchase a truly unique and personalised lily arrangement. The team at Four Seasons Flowers will carefully oversee your order until it has been safely delivered, so you can rest assured that your order with us is in safe hands. For a glorious lily arrangement, choose Four Seasons Florists today. The lily collection available from Four Seasons Flowers Aberdeen contains a fantastic range of beautiful lily arrangements which are bound to amaze. Fantastic for any occasion, a wonderful lily arrangement is closer than you think by ordering with us today. Furthermore, the florists at Four Seasons believe that it of the utmost importance that we can offer all of our customers a comprehensive service when they order with us today. This is why we offer a good range of flower delivery services for our customers to choose from when they order from us today. The Aberdeen flower delivery service operates a reliable and efficient service throughout Aberdeen and the local area six days a week. Therefore, it is easy for you to choose a day of the week which suits you for your delivery to take place, from Monday to Saturday. It is also possible for you to choose a time slot for your delivery to take place, either morning or afternoon. Flower delivery Aberdeen also offers a same day delivery service for all of our customers, which means that your gorgeous lily arrangement can be delivered to you on the very same day as you’ve ordered them. However, to be eligible for this delivery service it is essential that your order is placed with our team before 3pmj on the day in question, so that our florists have the time that they need to craft your gorgeous lily arrangement with the care and attention it deserves. 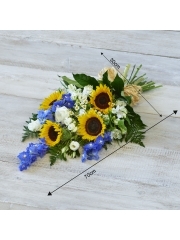 Four Seasons Flowers is also proud to be a member of the Interflora brand, which means that we can offer a range of flower delivery services further afield should you so require. Look no further that Four Seasons Aberdeen for a fantastic lily arrangement and great delivery services.